Alfakilo...nice job and good find! The height of the box doesn't need to be very high. Just high enough to accommodate the vacuum hose. Actually the thinner the height the more effective the vacuum will be. If you have a bakery or supermarket with a bakery look at the clear plastic boxes for cupcakes, muffins, cookies,etc. Once heated the embossed logos disappear usually. I get a lot of canopies from these boxes. Gotta build me a new vacuum form box soon. While we can make spinners, etc out of colored plastic, we'll probably want clear plastic for canopies. The stuff is expensive and I was stuck with left over plastic that was too small to be used for other projects. I needed something smaller where I could get more than one object out of a sheet of plastic. 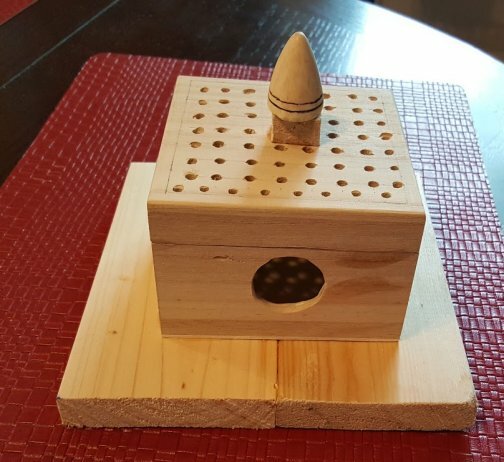 I was browsing thru the local Hobby Lobby and found a cheapo (about $3) small wooden box that works great. I mounted it to some scrap wood for stability, drilled some holes in the top, cut out a hole for my ShopVac, and made a plug holder out of a piece of balsa and a screw.